Ostadi, H.; Arroyo, M.; Prewet, P.D. ; Jiang, K.C. ; Huq, S.E. A mechanically deformable reflection transmission MOEMS system is capable of focusing X-rays to sub micron spots. This paper considers the geometry of the proposed deformed slotted microcantilever lens element under thermally derived strain, using finite element analysis. The work shows that an optimized MOEMS design using a slotted polyimide/gold thermal bimorph cantilever is capable of achieving ideal geometry with a larger than expected number of focusing slots – up to 111 at 2 μm width. Ostadi, H. [et al.]. 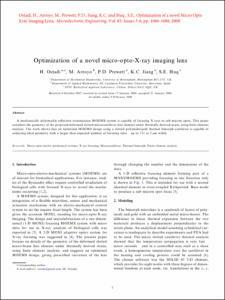 Optimization of a novel micro-opto-X-ray imaging lens. "Microelectronic engineering", Juny 2008, vol. 85, núm. 5-6, p. 1086-1088.